Beautiful views of Lake Dillon and Keystone mountain!!! New hot tubs! Summer - Steps to all of the following: Beautiful lake, town of Dillon, great restaurants, beautiful amphitheatre with summer concerts and nature nights, 24 mile long bike trail around lake, large marina/tike bar, great playground and picnic area. Gold Medal Trout Waters, Outlet Malls, etc. You are in the heart of Summit County. Winter - 10 minutes from Breckinridge, Keystone, Copper, A-Basin Ski areas. 30 Minutes to Vail. Steps to all of the following: Beautiful Lake, town of Dillon, great restaurants, and 24 mile long bike trail around lake, great playground, Outlet Malls, etc. You are in the heart of Summit County. Our Lake Cliffe Condominium is on the shore of Lake Dillon in the Heart of Dillon, Colorado, only 70 miles from Denver. 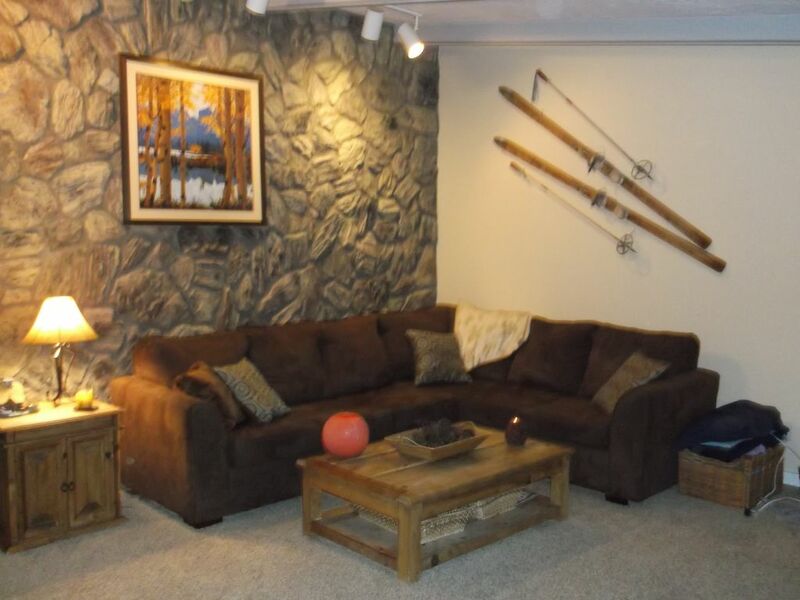 Featuring beautiful views of Lake Dillon and the surrounding mountains, this condo is minutes from almost any imaginable activity both winter and summer. Unlike many condos in Summit County, Lake Cliffe units have very nice floor plans. This unit has a spacious layout with a total of approximately 1100 square feet. The couch and sleeper sofa is very comfortable. It's all stylish and apealing. There is a large (15' x 19') living room with vaulted ceilings, a queen-size sleeper sofa, and a large rock wall ending in a corner gas fireplace. There is a flat screen TV, a DVD, plug in's for your phone and music, and nice views throughout the room. A selection of CDs, games, books, and magazines are provided for your enjoyment. The two bedrooms offer privacy by being well separated from each other and from the main living area. Each bedroom has its own bathroom, and each bathroom can be accessed from the main living area without entering a bedroom. The master bedroom (11' x 13') has a king-size and the second bedroom (10' x 13') has a queen bed with all new linens and down comforters. The master bedroom has vaulted ceilings and fantastic views of Buffalo Mountain and the Gore Range. The master bathroom has a private steam shower to soothe your muscles after an active day. The kitchen has went through a remodel July 2014. New cabinets, flooring, dishwasher and microwave have been added. It has ample closet and counter space. It has a full-size refrigerator/freezer, a microwave, a blender, a coffee maker, and all the cooking utensils, silverware, etc. that you could possibly need. There is a separate (10' x 11') dining area and a private (8' x 15') deck both with great views of Lake Dillon and the surrounding mountains, including many of the ski runs at Keystone, North Peak, and The Outback. There is year round access to the indoor swimming pool and two hot tubs in the clubhouse, which is just a few yards from our unit's entrance. Come spend some time at Lake Cliffe... You'll love it! Sorry, NO Pets and Smoking ONLY outside of the condo please. Bike, hike, ski, tennis player, and nature lover. Love the outdoors and enjoy every minute up here. Most relaxing and enjoyable place in the world. Great views of Keystone Ski Area, surrounding mountains and the 10 Mile Range. Large balcony overlooking Lake Dillon Marina and Lake wtih ample seating. Condo is on 25 mile long Running, Biking, Rollerblading trail that surrounds Lake Dillon with amazing mountain and lake views.